Sen. Claire McCaskill, D-Mo., asks a question of Secretary of Commerce Wilbur Ross during a Senate Finance Committee hearing last month. 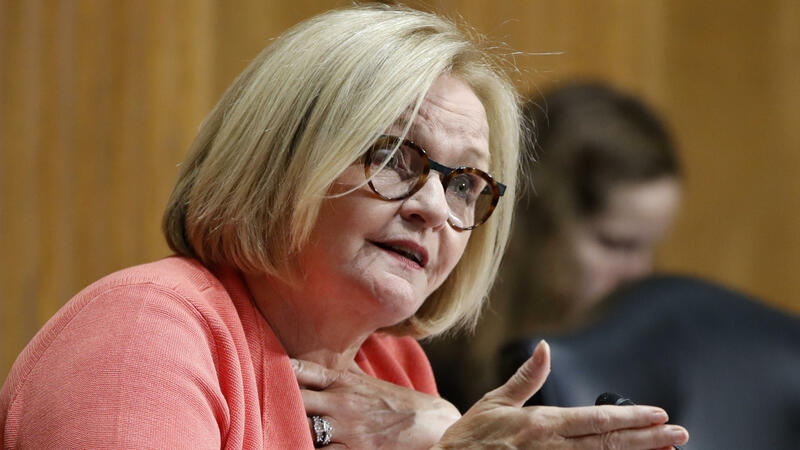 McCaskill has been a critic of Russia and of President Trump — who has at times doubted that any such interference happened at all and decried attempts by special counsel Robert Mueller to investigate as a "witch hunt." At a press conference last week after his summit with Russian President Vladimir Putin, Trump appeared to believe Putin's denials over the conclusions of U.S. intelligence agencies, though he later tried to walk that back. In a statement, McCaskill said she "will not be intimidated" by the attempts, which occurred around August 2017. "Russia continues to engage in cyber warfare against our democracy. I will continue to speak out and press to hold them accountable," McCaskill said in a statement. "While this attack was not successful, it is outrageous that they think they can get away with this. I will not be intimidated. I've said it before and I will say it again, Putin is a thug and a bully." "The hackers sent forged notification emails to Senate targets claiming the target's Microsoft Exchange password had expired, and instructing them to change it. If the target clicked on the link, he or she was taken to a convincing replica of the U.S. Senate's Active Directory Federation Services (ADFS) login page, a single sign-on point for e-mail and other services. "As with the Podesta phishing, each Senate phishing email had a different link coded with the recipient's email address. That allowed the fake password-change webpage to display the user's email address when they arrived, making the site more convincing." Trump tweeted earlier this week that if Russia did try to impact the 2018 elections, it would be to help Democrats — despite evidence that they intervened to hurt Clinton and help Trump two years ago. And now, this report has surfaced that Russian hackers were trying to breach the computers of one of the most vulnerable Senate Democrats — and not a Republican incumbent or candidate. The president is set to chair a meeting of the National Security Council on Friday to discuss election security, which Democrats and even many Republicans have said they fear he is taking too lightly in the wake of his comments last week. Director of National Intelligence Dan Coats has said that the "warning lights are blinking red again" about future Russian cyberattacks and that "the digital infrastructure that serves this country is literally under attack." Homeland Security Secretary Kirstjen Nielsen also said last week at the Aspen Security Forum that it would be "foolish" to think Russia is not trying to influence the 2018 elections. And FBI Director Christopher Wray also said last week in Aspen that Russia's attempts to undermine American democracy were ongoing.